Roger Goodell breaks silence on domestic abuse: "I will get it right"
NEW YORK -- Commissioner Roger Goodell acknowledged the NFL has dropped the ball on the issue of domestic violence, apologized for mishandling the Ray Rice case and pledged Friday that "now, I will get it right." "Unfortunately, over the past several weeks, we have seen all too much of the NFL doing wrong," he said. "That starts with me." Goodell: "I made a mistake"
Goodell made his first public statements in more than a week about the rash of NFL players involved in domestic violence when he held a news conference Friday. "We strongly, strongly condemn and will punish behavior that is totally unacceptable," Goodell said, citing domestic violence and child abuse among other transgressions. The commissioner announced the NFL wants to implement new personal conduct policies by the Super Bowl. 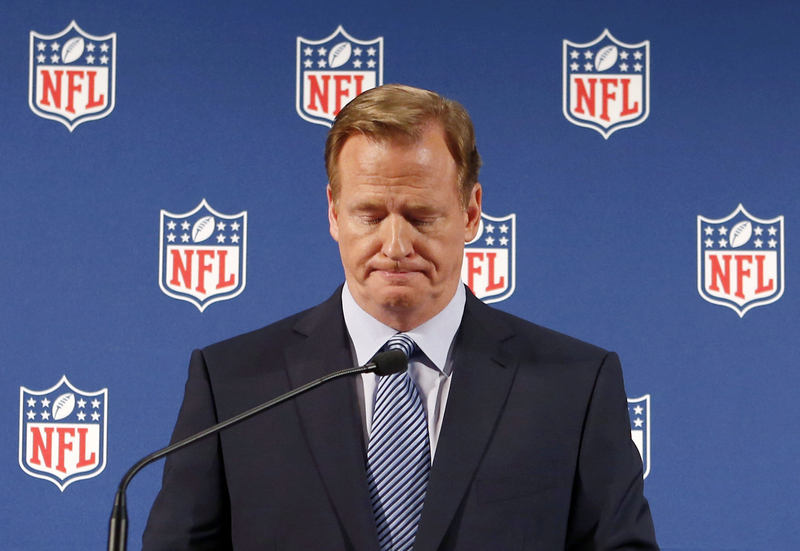 Goodell now oversees all personal conduct cases, deciding guilt and penalties. "We do not have a clear and consistent policy that allows us to deal with all of the issues that are arising," Goodell said. Goodell acknowledged that NFL policy and rules failed to set a high standard for disciplining domestic violence but also said that "these are very complex issues." "Our country has a legal system that everyone needs to respect," he said. The league has faced increasing criticism it has not acted quickly or emphatically enough concerning the domestic abuse cases. The commissioner and some NFL teams have been heavily criticized for lenient or delayed punishment of Ray Rice, Adrian Peterson and other players involved in recent domestic violence cases. Less than three weeks into the season, five such cases have made headlines, the others involving Greg Hardy, Ray McDonald and Jonathan Dwyer. Goodell said Friday that despite calls for him to step down, he has never considered resigning. He said he believes he has the support of the NFL's owners, his bosses. Vikings star running back Peterson, Carolina defensive end Hardy and Arizona running back Dwyer are on a special commissioner's exemption list and are being paid while they go through the legal process. McDonald, a defensive end for San Francisco, continues to practice and play while being investigated on suspicion of domestic violence. As these cases have come to light, such groups as the National Organization of Women and league partners and sponsors have come down hard on the NFL to be more responsive in dealing with them. Congress also is watching to see how the NFL reacts. In response to the criticism, the NFL announced it is partnering with a domestic violence hotline and a sexual violence resource center. Goodell also said in a memo to the clubs late Thursday that within the next 30 days, all NFL and team personnel will participate in education sessions on domestic violence and sexual assault. The memo said the league will work with the union in providing the "information and tools to understand and recognize domestic violence and sexual assault." "These commitments will enable both the hotline and NSVRC to help more people affected by domestic violence and sexual assault," Goodell said in the memo. The National Domestic Violence Hotline provides domestic violence victims and survivors access to a national network of resources and shelters. It is available 24 hours a day, seven days a week in 170 languages. Goodell noted that the hotline received 84 percent more calls from Sept. 8-15, and the organization said more than 50 percent of those calls went unanswered because of lack of staff. "The hotline will add 25 full-time advocates over the next few weeks that will result in an additional 750 calls a day being answered," he said. NSVRC supports sexual violence coalitions across the United States. The NFL's initial support will be directed toward state coalitions to provide additional resources to sexual assault hotlines. Goodell also announced that "all league and team personnel -- including executives, coaches, players and staff -- will participate in education sessions on domestic violence and sexual assault." CBSSports.com reported that Procter & Gamble pulled out of a major initiative for Breast Cancer Awareness Month with the NFL in light of recent off-field events. The NFL on Friday responded to Procter & Gamble's decision, saying the campaign will proceed without the sponsor's involvement. "We are looking forward to our sixth year of the Crucial Catch campaign, in partnership with the American Cancer Society. We understand the ways the last week have impacted our partners, including Crest. Players will still have the option to wear pink gear, including mouthguards, as planned, this year," the league said. On Thursday, the White House Thursday sternly told the NFL that "it's important that the league get a handle" on players who commit child abuse and domestic violence and that the league must "have a zero tolerance" regarding those issues. On Monday, the NFL tapped three experts in domestic violence to serve as senior advisers to the league. Goodell said Lisa Friel, Jane Randel and Rita Smith will "help lead and shape the NFL's policies and programs relating to domestic violence and sexual assault."